Are you constantly sharing with friends, family and colleagues on social media? Now, once again, Marriott Rewards is changing the game with PlusPoints, a new, easy and fast way to earn points whenever and however you connect. All those Likes, Tweets, re-Tweets, Instagram posts and Foursquare check-ins can instantly result in up to 2,000 PlusPoints per month. Download image. With PlusPoints, Marriott Rewards members see their points accumulate immediately, in real time. PlusPoints can be earned everyday through social media sharing – enrolled members will receive 25 points each time they share content about Marriott Rewards and our hotels and 250 points when they Like a hotel’s Facebook page or follow a property on Twitter. PlusPoints are instantly loaded into the member’s Marriott Rewards account and a confirmation will be sent by email. With PlusPoint’s easy and instant way to earn points, Marriott Rewards is also offering low-point redemption options. For as little as 5,000 points, members can purchase a $10 gift card for Best Buy, Gap, Lowes or Macy’s or view a variety of merchandise options. Members can also spend 7,500 points for a $15 iTunes gift card. To get started and begin earning PlusPoints, visit www.marriottrewardspluspoints.com. Is this an exciting new program? You bet! Is it bribery? Nah, we prefer to say ‘viral marketing’. Google has been slowly improving their travel tools and now just launched new features for Google Flights and Hotel Finder. The Hotel Finder is very impressive. For instance, with a few clicks, I can find 828 hotels in Los Angeles. I can then sort the results by price, star rating, user rating, or price compared to usual. I was able to find a great room at the W Hotel in Hollywood for tonight for only $118. Google says that price is 56 percent lower than the usual price. 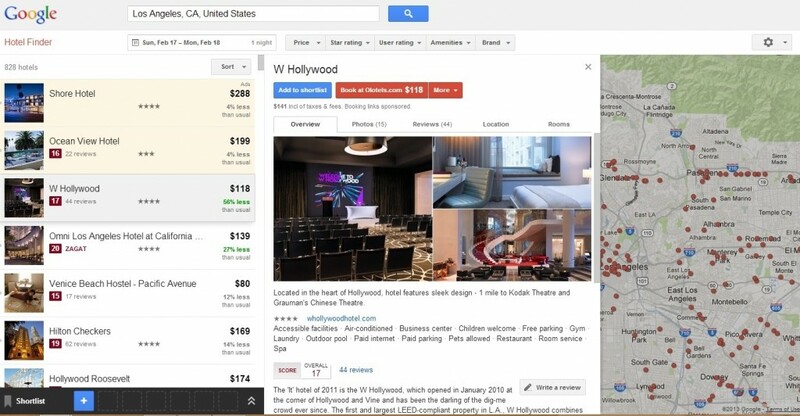 Google also added an incredible new feature that allows you to check out the neighborhood around the hotel you select. It is very handy for first time visitors who are looking for a walk-able location, like Hollywood. You can even draw your own custom map area to find a hotel that meets all of your needs. You can now even search an area by brand if you are a Hilton Honors or Marriott Rewards collector. Because of the new search features, be sure to take a few minutes and review the information for your hotel and make sure everything is correct. Also, make sure all of your features are listed. Potential guests will now search for things like ‘downtown Los Angeles, 3 stars or more, and free wi-fi’. If you do not have free wi-fi listed as a feature of your hotel, you will miss out on potential reservations. Be sure to also take a minute to review your star ratings, and your internet reputation.